Tomer's Take: Ski Whistler/Blackcomb or Banff on Friday, Schweitzer or Whitefish on Saturday, Tahoe on Sunday and Schweitzer, Sun Valley or Banff on Monday. A very active pattern is setting up for the Pacific Northwest with an atmospheric river taking shape. There are three to four different storm systems lined up. Blow-off precipitation appears to hit intermountain ski areas like Schweitzer, Whitefish and Banff. This pattern has the potential to sink further south into Northern California over the weekend and next week although it's not a lock. 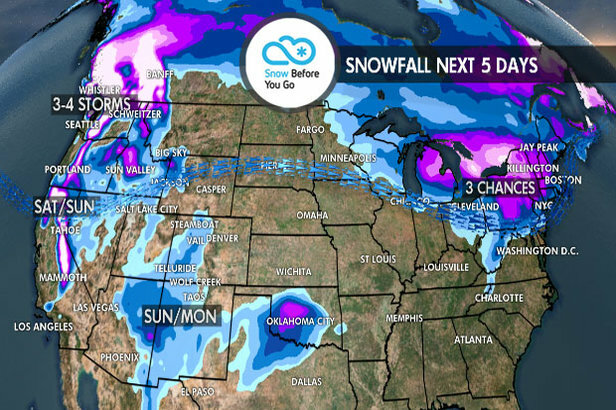 In the Northeast, a couple light snows move through followed by a potentially larger storm system over the weekend. 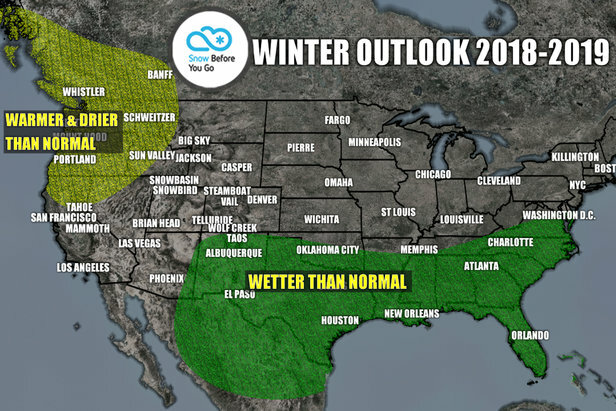 El Nino watch continues with a 90 percent chance of developing. However, sea surface temperatures in the south Pacific near the equator actually cooled slightly in late December. Three to four different storm systems are lined up with a potential atmospheric-river type setup. That means heavy moisture potential. Plan on heavy snow accumulations in the high Cascades, Volcanoes and Olympic Range. Total accumulations could range from 3-6 feet by Tuesday depending on elevation. It's going to be a snowy five day period with three different storm systems. The best snow days are Thursday, Friday, Sunday, Monday and Tuesday. Heavy snow accumulations. Three to four different storm systems are lined up. Heavy snow accumulations are likely over the next five days. 3-6 feet by Tuesday. It's a mostly dry pattern until Sunday when light snow arrives. Light snow may trickle into Monday morning. Best days to ski powder are Sunday and Monday. 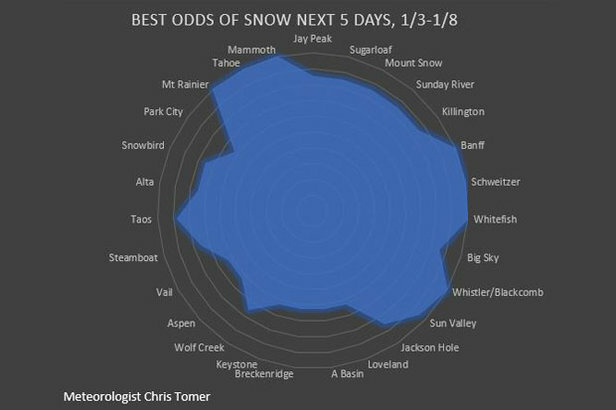 Ski Resorts with the best chances for snow through this weekend, 1.3.2019. The pattern favors Schweitzer and Whitefish for snow on Thursday-Friday. A more widespread snow arrives Sunday, Monday and possibly Tuesday at Jackson Hole, Grand Targhee, Sun Valley, Big Sky, Discovery and Bridger Bowl. Light snow is possible between Sunday and Monday, otherwise dry. A wave of light to moderate snow blows through on Thursday followed by another wave of light snow on Friday. That second wave has the potential to fall apart. Then a larger storm system moves in Saturday-Sunday. It looks warm with snow changing to rain or a mix then back to snow at the tail end. Another quick hitting snow is possible Monday-Tuesday.